“TipNotes” is a new series on this blog with useful tips & tricks on how to get the most out of SnipNotes. 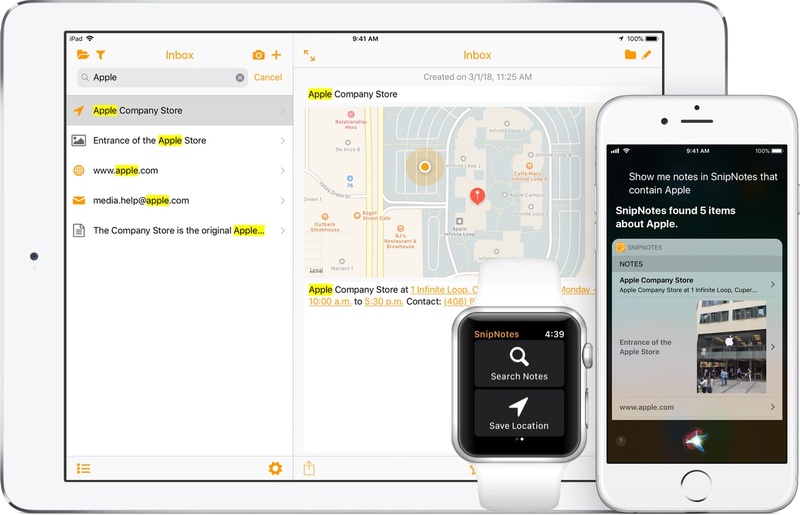 SnipNotes allows you to create external links for your notes. You can use these links to quickly return to a specific note from another app. Pro Tip: SnipNotes uses an URL scheme to enable this kind of navigation between apps. You can use your own URL scheme to create new notes in SnipNotes and search for notes. Click here to learn more. This entry was posted in General on 04/18/2019 by SnipNotes. In addition to the note’s title, SnipNotes will preview the first lines of the note. If your note contains any images, the first image will appear as a little thumbnail on the right side. The notes list can now also show formatted text (bold, underlined, etc.) and bullet lists. This entry was posted in General on 04/13/2019 by SnipNotes. Put SnipNotes side-by-side with another app (e.g. Safari) and start copying text or images. SnipNotes will automatically create a new note out of each clipping. 🎉 Every text note will have the URL of the webpage attached to the bottom. This entry was posted in General on 04/10/2019 by SnipNotes. 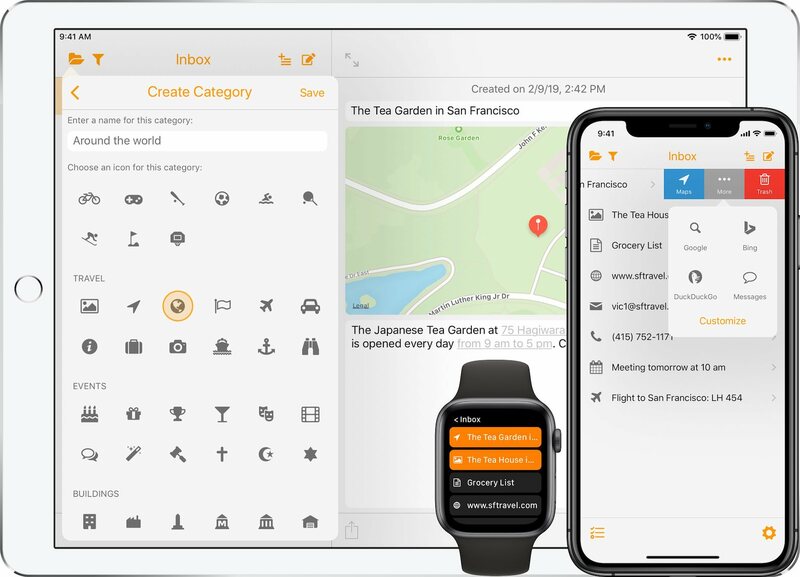 SnipNotes 2.9 for iOS and SnipNotes 1.5 for macOS are now available! Note Actions have been available since the introduction of SnipNotes 2.0 in 2016. While they proved to be very useful in many situations, their UI has always been a bit messy. The buttons were small and hard to press, the settings screen was cluttered. This all changes today: Note Actions have been completely overhauled. The blue button shows an action depending on the content of your note. If you have saved an address for example, you can quickly open Maps to begin navigation. The gray “More” button reveals a popover with additional actions for the note. These actions are available for all types of notes and allow you to quickly use your notes with other apps. For example, you can search a note with Google in Safari, put it into an email or open it in apps like Evernote, Bear, Drafts and Day One. First of all, there are over 50 new category icons from a wide spectrum of topics like sports, events and travel. The icons have been organized into multiple sections to ensure a good overview. Second, you can now also change the icon of your notes! Since the icon is no longer needed to trigger an action (remember the blue button), you can now easily replace it with something better suited to represent your note. All category icons are also available for your notes. They synchronize over iCloud and are always up to date on all your devices. There is a new archive for your completed notes. Notes in the archive disappear from your main list but are still synchronized with iCloud. Swipe right on a note to quickly move it into the archive. You gain more control over the order of your notes. While there is no manual sorting yet, you can now change the creation date and modification date of a note. In addition, notes will only get marked as modified when you change their contents or the title. Various note actions like delete, move, merge and archive will now display a status bar at the bottom of the screen, which you can use to undo the action. Of course, you can still undo actions “the classic way” by shaking your device. Last but not least, there is now a tip jar in the settings menu. If you enjoy the app and want to support the future development of SnipNotes, I would appreciate a small tip. Thank you! Thanks for reading this far! If you have any questions or feedback, please get in touch with me. This entry was posted in General on 02/12/2019 by SnipNotes. 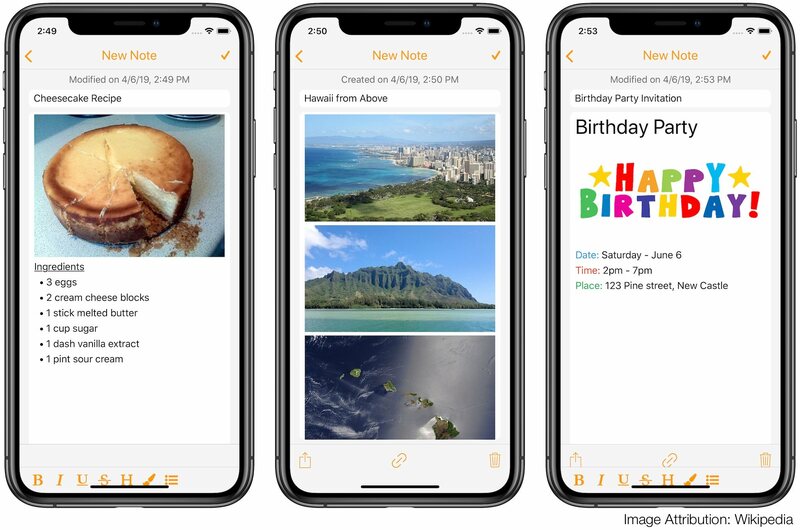 In line with the release of iOS 12, I'm happy to announce a big update for SnipNotes, which takes advantage of the operating system's new features. 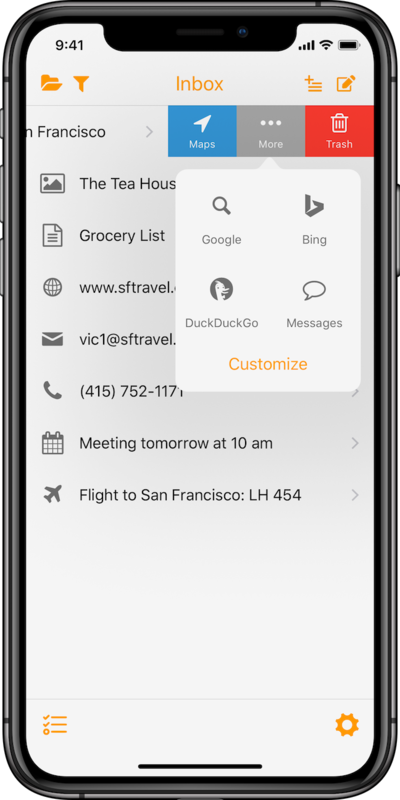 This update focuses on the integration of Siri Shortcut, which lets you automate frequently used actions and trigger them with your voice. This entry was posted in General on 09/21/2018 by SnipNotes. I'm happy to announce a frequently requested change to the SnipNotes pricing model: The iOS app can now be downloaded and used completely free of charge for 7 days. After this period the app becomes read-only and must be unlocked with a one-time purchase. This change doesn't have any effect on existing users and is currently limited to the iOS version of SnipNotes. If proven successful, I will also introduce a free trial for the macOS version. This entry was posted in General on 08/30/2018 by SnipNotes. The SnipNotes Formatting Update has arrived! 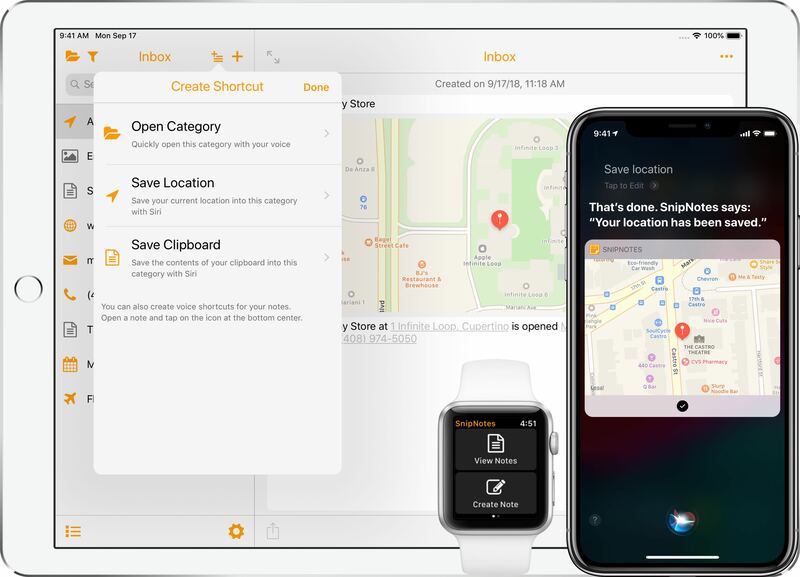 Since its release in February of 2015, SnipNotes has evolved from a simple clipboard manager into a comprehensive note-taking app. 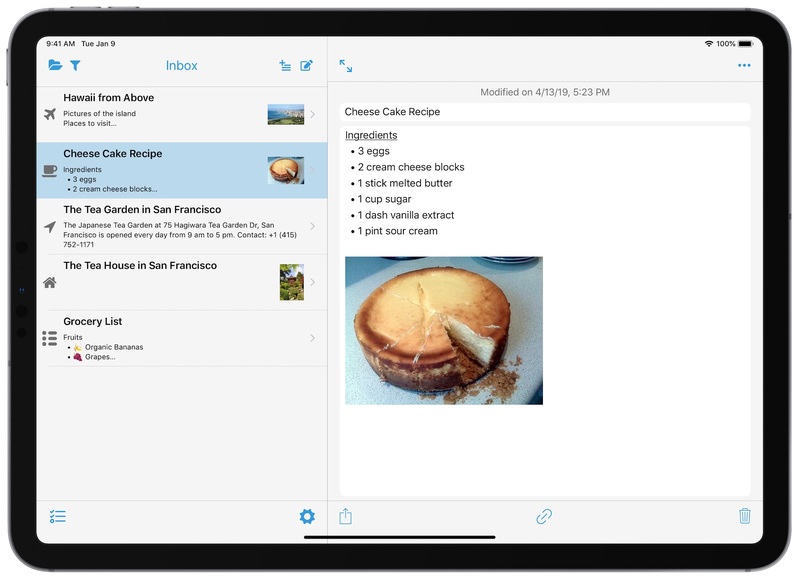 The app has gained many new ways for adding and organizing notes. One part, however, has remained largely unchanged: SnipNotes was only able to store and display notes with plain text. That restriction gets finally lifted with this update. This entry was posted in General on 08/07/2018 by SnipNotes.